AMD says its partnership with Bethesda is not just a marketing play. As expected, AMD talked a little bit about its upcoming Vega GPU architecture during its second annual Capsaicin and Cream event at GDC 2017 earlier today. The company revealed that its next-generation graphics cards will be called Radeon RX Vega rather than bumping up the series to Radeon RX 500. However the bigger surprise was when Radeon boss Raja Koduri announced a "unique partnership" with Bethesda in which the game studio will optimize its games for Ryzen and Vega. "This is a true engineering collaboration between the companies, not just kind of marketing or branding stuff," Koduri said. "We have dedicated engineers on both sides working on optimizations and leveraging multiple cores, and all the new features in the Radeon GPUs." If this truly is more than a marketing ploy, then it is indeed a big deal. Bethesda is behind some of the biggest franchises in gaming—collectively speaking the company has sold 80 million copies of The Elder Scrolls series, Fallout 3 and 4, Doom, Wolfenstein: The New Order, Quake, and Dishonored. One of the main goals of this long-term strategic partnership is to "accelerate the implementation" of Vulkan, a low-level API developed from AMD's Mantle, along with other new technologies being introduced with Ryzen and Vega. "This is a disruptive moment in the industry as games demand increasingly more power from today's graphics architectures to deliver detailed worlds and characters at ever higher resolutions, frame rates, and quality settings," Koduri said in a statement. "Working independently, game developers and graphics companies will eventually address the challenges of this new era of gaming; but working in close collaboration, the pace of that progress can advance exponentially." What this means for end users is that future games developed by Bethesda might run better on AMD platforms versus Intel hardware, though AMD and Bethesda didn't go into detail here. A glimpse of what's in store was provided last year when AMD and Bethesda worked to inject Vulkan into Doom. It was the first AAA game to utilize the low-level API, though today's announcement means it will not be the last. 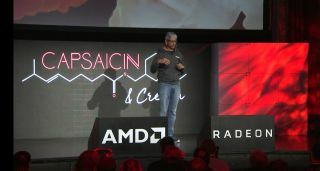 You can watch the full Capsaicin and Cream event below, Fast forward to the 1hr38min mark to see AMD talk about its partnership with Bethesda.